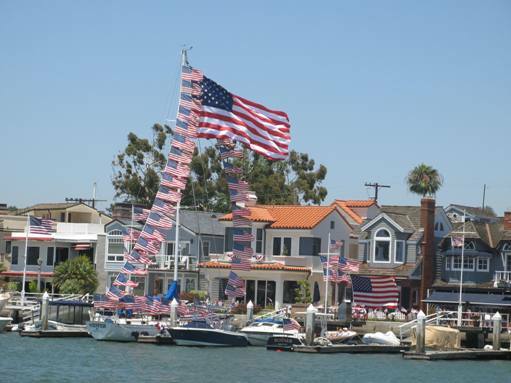 The Fourth of July in Newport Beach is a pretty big event. There are lots of celebrations going on through out the city of Newport Beach and the city of Huntington Beach. And there are many visitors who come to celebrate the Fourth of July in Newport Beach. 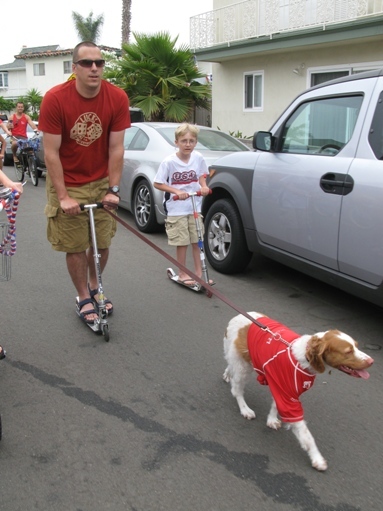 There is the Annual Huntington Beach Fourth of July parade which is held on Main Street in Huntington Beach. Huntington Beach has sponsored the Surf City Fourth of July Parade and Celebration since July 4, 1904. The parade was to celebrate the arrival of the first electric passenger train. The Surf City Fourth of July parade is the largest parade west of the Mississippi. Huntington Beach also has a fireworks show in the evening, and it is visible by sitting on the beach in Huntington Beach. The residents of west Newport usually can view it as well . 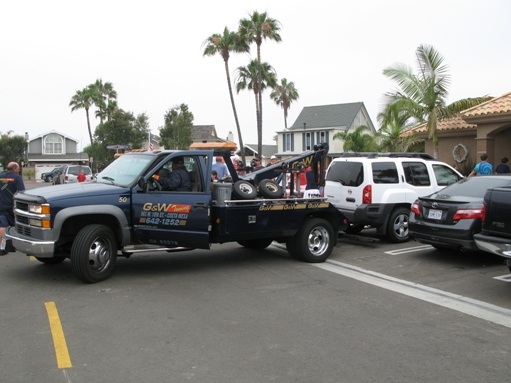 . .
Newport Shores in Newport Beach has a local parade for the residents of Newport Shores. Decorate your bikes, skate boards, children, dogs, etc and meet at the community clubhouse at 8:30 for some coffee and donuts on the 4th of July. The parade begins at 9am and goes around the neighborhood. The Newport Beach Fire Department has shown up in the past at the summation of the parade. It is a great time for kids and their families alike. 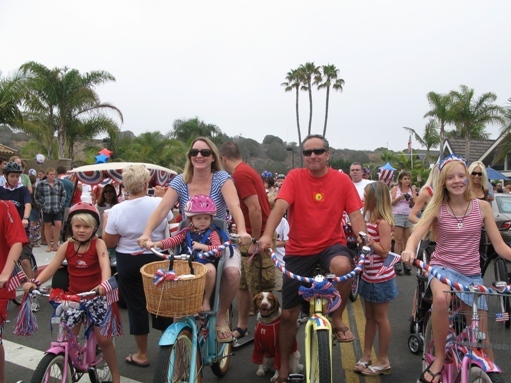 There are activities all day long in the Newport Shores community for the kids to celebrate the 4th! 1300 Irvine Avenue, Newport Beach. On July 4, 2010, there is the 53rd Old Glory Boat Parade. 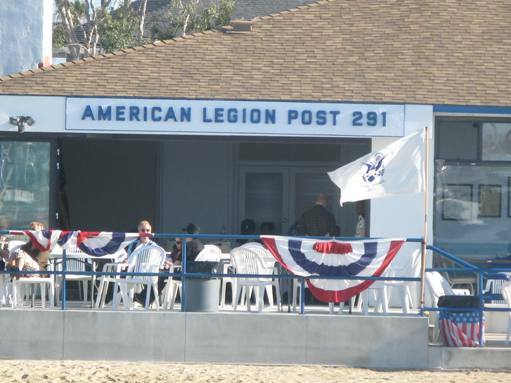 The Old Glory Boat Parade is sponsored by the American Legion Yacht Club and the American Legion Post 291. The parade will begin at 1 p.m. And there are some who are incredibly patriotic! Look at this boat below – beautiful! The City of Newport Beach along with the Newport Dunes Waterfront Resort is co-sponsoring a Fireworks Extravaganza. The Fireworks Extravaganza will be at the Newport Dunes Waterfront Resort: 1131 Back Bay Drive, Newport Beach. The fireworks show will begin at 9 p.m. on Sunday, July 4, 2010. 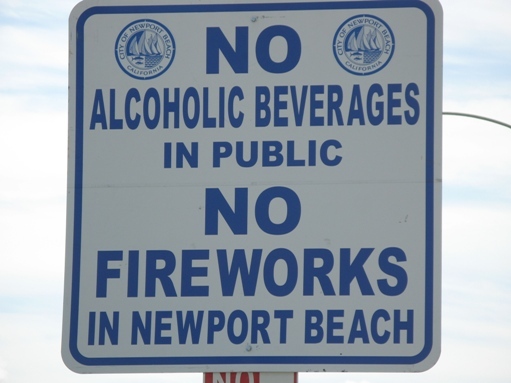 Just so you know, the possession and use of fireworks are illegal in the City of Newport Beach. So be on the safe side, and just come and watch the professional shows – they really are amazing. And if you are planning on coming to the beach in Newport Beach on the 4th, get here early. I have been up at 5:30 am looking for parking spaces without success. Parking is limited, and many of the streets on the Peninsula are closed. The city usually starts setting up the barricades a few days before the Fourth of July in anticipation of the crowds. The parking lots at Huntington State Beach also fill up, I recommend arriving as early as possible. Another suggestion – be careful where you park . . . or you could end up getting towed! That would not be a fun way to celebrate your Fourth of July celebration! That is what is happening in Newport for the 4th of July. 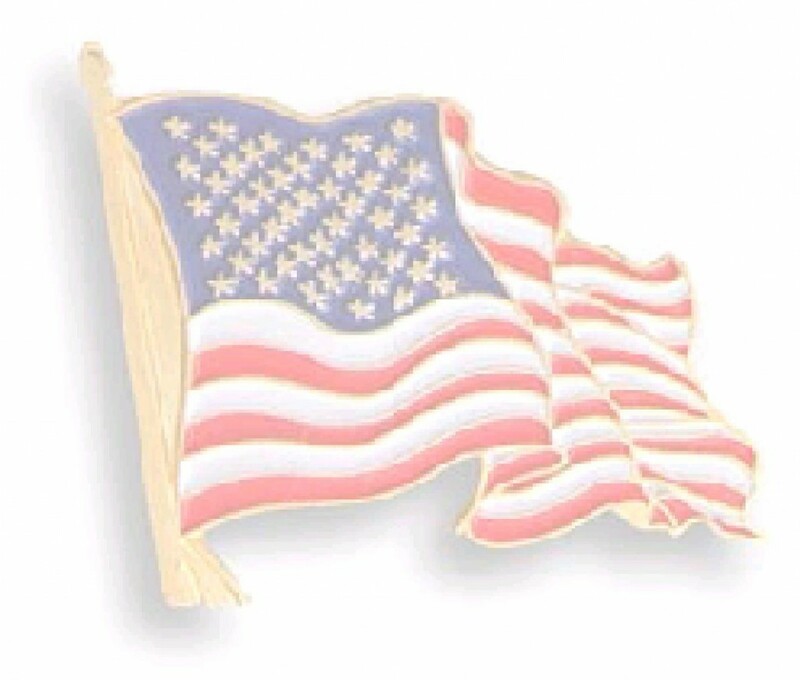 Hope you have a wonderful and safe 4th of July!